See a charming French city in a unique way with this 75-minute small-group Segway tour of Lyon. Ride along the river through Lyon's historic center with your guide. Learn about the two rivers, the Rhône and the Saône, that define the neighborhood that was once the entirety of Lyon. Choose an afternoon or evening tour. Group size is limited to 8 people. 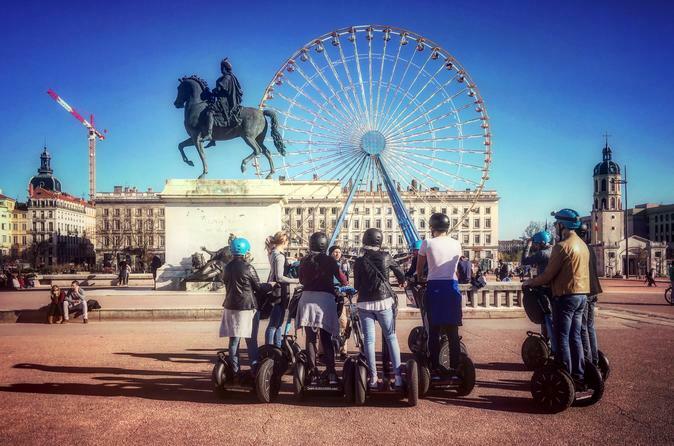 Make your way to the appointed location near Place Bellecour and the Rhône River in the heart of Lyon, where you'll meet your guide and get acquainted with your Segway. Learn how to operate your Segway for the first 15-20 minutes after a safety briefing, and then set off with your guide to explore the city. Ride along the banks of the Rhône, with views of historic Lyon in the distance. Cross the Pont Morand (Morand Bridge) to explore the city. Zip through the Places des Terreaux. See the Bartholdi Fountain. Hear about the history of the opera in Lyon. Follow your guide through the historic center, returning to Place Bellecour at the end of the tour via the banks of the Saône River.